Hello! No, I'm not Kaity. She's busy being mommy to baby #2...and to Charlie...so, I'm honored to help out by talking about a topic that Kaity and I bond over - books! I'm Erin, a bookworm/booknerd/booklover, and I'm a self-professed book challenge junkie. (Psssst...so is Kaity.) 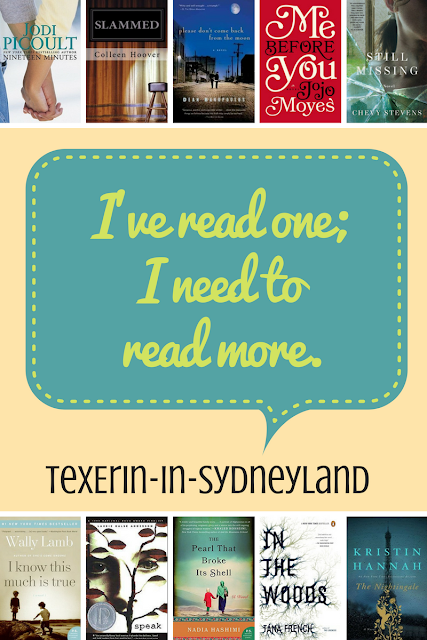 I blog at TexErin-in-SydneyLand and host a book challenge that Kaity participates in at Book Challenge by Erin. Stop by and visit me. Today, I'm going to tell you about some authors ... specifically, the fact that I've read one (and only one) book by each of these authors, but that one reading adventure convinced me that I need to read more from them. A variety of genres are represented - YA, contemporary fiction, historical fiction, mystery/thrillers, and international settings. These are "my top ten authors that I've read one book, and I need to read more". "Whoa. Centered around a high school shooting, you know it's going to be a provocative topic to read. All the different perspectives are examined of what leads to this event, the aftermath of it, and the views of those involved. As I was reading, I felt angry, sad, and horrified; I felt empty in some passages, and full of emotion in others. A great read." I have 6 Jodi Picoult books added to my "to read" list already. Next up (I think) will be The Pact. 2. Colleen Hoover - This (primarily) YA author seems to receive praise for almost every book she writes from almost every reader that I know. I read Slammed, really enjoyed it, rated it 5 stars. But, for some reason, I didn't care to read the two other books in this particular trilogy. I didn't think the story needed more. I keep intending to pick up another book of hers...Hopeless and Maybe Someday are the two on my radar. Maybe, someday, I'll actually grab one and read it. See what I did there? Yep, I'm a dork. 3. Dean Bakopoulos - One of my fellow booklovin' bloggers is a huge fangirl of this author. You can hear what she and her partner-in-book-crime have to say about him in this podcast of theirs: The Armchair Librarians. I read (and was enamored with) Please Don't Come Back from the Moon, so I will definitely read more from Mr. Bakopoulos. 4. Jojo Moyes - I confess: I hesitated reading Me Before You. It was receiving so many rave reviews that I worried that there was no possible way that it could live up to the hype. Thank goodness I read it. I'm so glad I didn't miss out on the story of Will and Louise. I have four other books from this author on my "to read" list. I don't plan to wait around for years (again) before I finally read more of her stories. 5. Chevy Stevens - Through the world of blogging and book lovin' bloggers, I discovered this author and picked up her thriller Still Missing. It was a solid read that I thoroughly enjoyed and convinced me to read more. 6. Wally Lamb - I described I Know This Much Is True as "an emotional journey" with "some gut-wrenching, heart-breaking, cringe-causing moments." The writing skill of Wally Lamb (in the book I read) is remarkable. I hope his other books reinforce this sentiment. 7. Laurie Halse Anderson - After reading Speak, I thought quite a bit about the dangers of teenagers, and the problems that they face. I questioned why, as a society, aren't we better equipped with preventing some of those dangerous acts? Or giving assistance when dangers are met? Just read this book that was originally published in 1999. You'll understand what troubles me. Next up, Wintergirls. 8. Nadia Hashimi - Since reading The Pearl That Broke Its Shell, I've been singing its praises. It was a informative, heart-breaking, and powerful book. If you have read and enjoyed Khaled Hosseini's books, then this is a must read. I plan to read When the Moon is Low sometime soon. 9. Tana French - I recently read In the Woods which is the first in a series called the "Dublin Murder Squad". I enjoyed it enough to commit myself to continuing the series. I've had feedback from a couple of other mystery/thriller readers that as the series continues it gets better and better. Have you read any of these authors? Do you have book recommendations that are "must reads" from their collection of books? Are there any authors that you've only read one book, but know you want to read more?